Mixing a song between two or more recordings studios comes with a fair few challenges. The most demanding is being able to get a mix to sound “balanced” between different rooms. No two studios are ever the same when it comes to room response, factor in different monitor types and monitor placement options and it’s small wonder how any of us can mix a song to sound exactly how we intend it to sound within a variety of studios. “Monitor Trust” is something I’ve struggled with many times when I’ve mixed a song between two very different sets of monitors across two different studios. Which “mix position” is THE point of reference I should trust the most? This is a complex many of us have had to deal with at some point. Which Studio Should My Ears Trust The Most? Depends on the room, what you hear, how your early mixes translate in the outside world, which studio you believe reveals problems that you easily address and which studio could be masking issues that can cause problems elsewhere. It’s so important to trust what you are hearing in a studio as then you will be able to fully trust your judgement and decision making process when mixing a track. A simple way to determine whether or not a monitoring setup in a studio is right for you is to play a selection of reference tracks that you know the sound of extremely well. If you hear and interpret those mixes exactly how you know they should sound then you should be able to trust the studio you are in and get on with the mix. If you struggle to hear any differences between the studio you are in and a studio you know to trust then you may need some technical intervention to bridge the monitor disparity in the forms of speaker calibration software. Speaker Calibration software alters the frequency response of studio monitors providing users with a more neutral listening environment. These solutions work very well. The whole point of Speaker Calibration is to help users produce better mixes that translate better in "real world" playback systems. My wife and I have two studios in our house. One is in a purpose built soundproof cabin at the end of our garden, the other is a smaller Pro Tools rig nestled into the corner of a spare bedroom. Our larger garden studio has a serious set of ADAM Audio P22A studio monitors positioned well away from the walls to aid the response with a sub woofer plumbed in for extra low-end reach. Acoustic treatment is a plenty in this studio that we refer to as “The Mothership”. The sound of a space is nice and dry with an airy live quality. 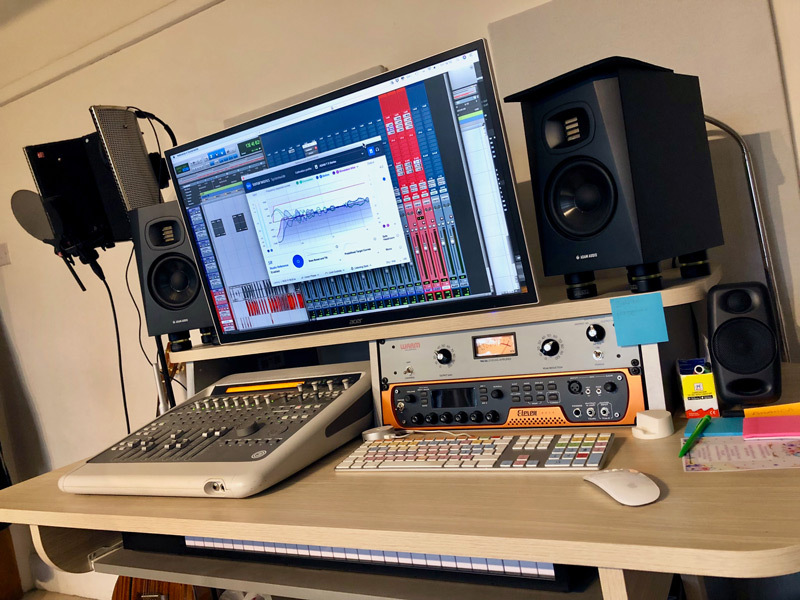 I have invested a good chunk of time and money into getting our big studio to sound as good as possible and has proved to me to be a trustworthy environment to mix in, though it does have a couple of predicable room mode issues… but what studio doesn’t, right? Our second small home studio is a much simpler affair as space is limited. There is barely any acoustic treatment, the monitors (ADAM Audio T5 - read our review) are much smaller in driver size than our large ADAM’s in the garden studio. Positioning is also a bit of a compromise which means the T5 monitors are very close to the walls, a bit too close for my liking if you ask me but we have to work with the space we’ve got. This home studio is at it’s limits of what we can do in terms of setup before we go too far and the “bedroom” stops being a domestic living space and turns into big studio number 2, which we don’t want. Weekends in our household are for family time, however, there are the occasional down time moments when our kids keep themselves entertained about the house. In these times I like to use our small home studio to track and mix in as I can stay within calling distance if I’m needed by any of my family. If I choose to disappear down to the big garden studio in these quiet times I often get carried away losing total track of time which gets me into trouble when I come back up to the house half a day later. So, we have a small setup I can use and a large studio… but the smaller ADAM audio T-Series don’t sound anywhere near as full range as my larger ADAM Audio P22As in the Mothership studio. I hate listening back to my mixes on different systems as issues often get revealed that I missed or couldn’t hear in the first place, such moments makes me feel as though I’ve wasted my time. This generally happens when I mix on small monitors later referencing through larger monitors in better sounding rooms. When I mixed my first song in our home studio and took it down to the large studio I could hear loads of glaringly obvious problems in the low-end and stereo imaging that I just couldn’t hear before on the small monitors in the untreated home studio, which was very frustrating to say the least. I had to think of a way to avoid this type of disappointment happening again… I then remembered that Sonarworks Reference 4 speaker calibration (that I use everyday in our Mothership studio) has 3 activations per licence. I was only using one of those activations in our big studio so I had two spare available. I quickly installed Reference 4 on our home studio computer, ran the measurement process and waited for my next weekend’s downtime for the chance to mix a new song to find out if I could get a mix to sound “tonally” similar between both studios. The results were quite amazing! Besides a small bump in the sub range in The Mothership, both studios now have a monitor response that are comparable whereas before without the assistance of Sonarworks’ speaker calibration the two rooms made it difficult for me to know exactly which mix position was the best and most trustworthy studio to finish a mix in. The title of this article describes Sonarworks Reference 4 as a secret weapon, it’s no secret, though I did forget about it if not totally overlook it when I first started mixing between our two very different studios. If Reference 4 isn’t a secret weapon then what is it? It’s a no-brainer plug-in! Simply put, it removes monitor doubt that can occur when moving a mix session between two studios. Monitor doubt is a complex many of us experience when we hear our beloved mixes through different systems, remove the doubt and the music and our hard work can be fully appreciated regardless of the differences in gear and studios. If you own a licence of Sonarworks Reference 4 then there’s no excuse for not making good use of another of the three available activations on your second or third studio computers as the system is, from my experiences, essential when mixing between multiple studios. Yet to try Sonarworks Reference 4 in your studio? Download the demo and let us know how you get on.